Experience Magical Sicily and Its Legendary Food -- as a Gluten Free Traveler! Although I have some ancestors from Sicily, I really don't know much about that part of Italy. My travels thus far have focused on what I call the "big three:" Rome, Florence, and Venice -- and a lovely week in the region of Umbria in central Italy. What I didn't know until recently is that Sicily is where the Italians themselves vacation! This is due to its wonderful climate, gorgeous beaches, and legendary food. In fact, Sicily is where Italy likely gets its reputation as a culinary dream. Since it has been at the geographical crossroads of so many different cultures over the millennia, it has blended influences into what most agree is exceptional cuisine. This is where southern Italian dishes that many American Italians grew up on originated. For example, "red gravy" (tomato sauce) has its origins here. And, as in most areas of Italy, you'll be able to find gluten free pasta offered as an option in many restaurants. Much of the food in Sicily is farm to table, so there is a freshness and quality that you don't always find in other locations. 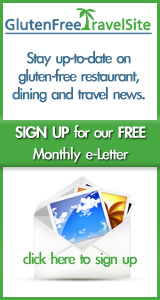 For gluten free travelers, Ellen Morse of Gluten Free Travel-Us makes it even easier -- and worry free -- to travel to this beautiful part of the Mediterranean. She has just introduced a new itinerary for Palermo and western Sicily. And as always, she has vetted the hotels and restaurants for her gluten free clientele. You can let Ellen do the work planning all the details of your trip -- including the restaurants where you'll enjoy some of Sicily's best food. Of course, much of what Sicilians eat is naturally gluten free...fish is prevalent, and swordfish caught in the Strait of Messina (in between the toe of Italy and Sicily) is some of the best in the world. Blood oranges (known as arance siciliane, or Sicilian oranges) and pistachios are grown on Sicily. Even though Sicily may seem more remote than cities on the mainland, it's a very easy connection from many European cities via all the main European carriers (you don't even need to fly through Rome or another Italian city first). Another surprise to me was how Sicily has more ruins of Greek temples (and quite well preserved) than any place outside of Greece. Agrigento's "Valley of the Temples, a UNESCO Heritage site and one of the finest examples of an Ancient Greek Doric style temple, is a popular stop for travelers visiting Sicily. Ellen's itinerary, which she has designed with the help of her partners at Select Italy, will take you to many of these archeological sites. Of course, you can customize the suggested itinerary, laid out on this page of our website, however you like -- based on your interests, travel preferences, desired duration of trip, and budget. This is not a group tour...it can be taken at any time and with anyone you choose (although you're welcome to put together your own group of friends!). Apparently Sicily has a charm, climate, and level of cuisine not even found on the mainland of Italy. Coupled with its rich history of influences dating back thousands of years, it sounds like something to push to the top of my own travel Bucket List. I love touring places where I can stimulate my mind by learning history...while also meandering through quaint medieval towns and dining on local specialties (not to mention savoring good Italian wine!). Beautiful beaches and vistas are just icing on the (gluten free) cake! Ellen has made sure to include all of this within her suggested itinerary for Sicily. You'll enjoy winery tours and tastings, cooking classes (with gluten free modifications made if needed), and stays in beautiful inns with relaxing surroundings and an interesting history (one is a former wine and olive oil production facility dating back to the 18th century). A couple notes: Sicily has become one of the top destinations in Italy. Fortunately, due to its climate (only down in the 40s in the Winter), it is a year-round destination. Spring and Summer are considered its high seasons (although prices still stay on the higher side in the Fall, too.) This is also a destination where many "heritage" travelers come to trace their ancestors (perhaps this will be me down the road). Ellen does her best to assist in arranging for transport to some of these smaller villages. So give Ellen a call at 312-337-9235 or email her at ellen@glutenfreetravel-us.com for pricing and answers to any of your questions.